Surrounding Santa Fe is a diversity of hikes unequaled by any other area of the state. 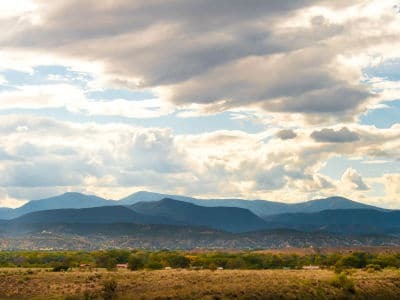 The 12,000 foot peaks of the Sangre de Cristo Mountains, the canyons and caldera of the Jemez Mountains, and the more arid high-altitude desert landscapes south of the city all within an hour drive of Santa Fe. Nationally designated wilderness areas, including the Santa Fe National Forest with over a million and a half acres of land, ring the city. Five of the seven life zones can also be found within an hour of Santa Fe, providing for an abundant diversity in plant and animal species. Spectacular geological variation adds to the allure of open space, turquoise skies, and over 300 days of sunshine. Year- round hiking is possible because of quick altitude changes resulting in mild microclimates. 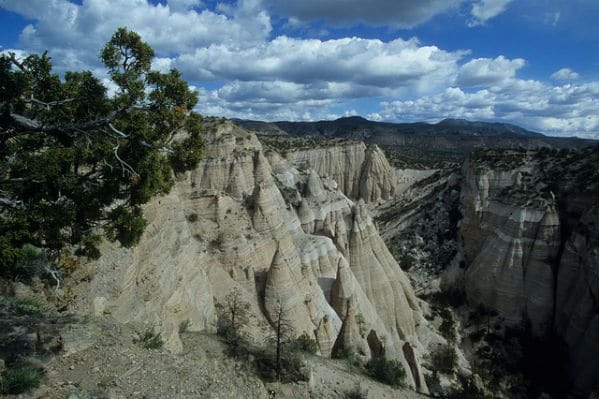 One of my favorite hikes is the canyon trail at Kasha-Katuwe Tent Rocks National Monument. There’s a fascinating slot canyon that opens into spectacular tuff pinnacles whose shape resemble tents. Becoming a series of switchbacks, the trail climbs to the ridge where 365 degree views await. This year-round destination is just 45 minutes driving south of Santa Fe. Hiking time is approximately 2 hours and is rated “easy” by The Sierra Club. I like to arrive early in the morning to beat the crowd and the heat of summer. Trailheads for the Dale Ball and Dorothy Stuart Trail Systems are barely 5 minutes driving from downtown. These extensive urban trails through the Santa Fe foothills, are perfect for when I need a quick, easy hike, especially around sunset. With beautiful city and mountain views at an elevation of 7000 to 7500 feet, I can enjoy these trails for biking as well as hiking. One of the most exceptional autumn hikes in the Santa Fe area is Aspen Vista Trail at 10,000 feet in the Sangre de Cristo mountains, about 20 minutes driving from downtown. This hike ranges from easy to strenuous, taking the trail through a huge aspen forest, spectacular in fall, but beautiful anytime of year. It is possible to take the entire trail, crossing canyon creeks cutting through a towering fir and spruce forest, to Tesuque Peak, elevation 12,040 feet. Atalaya Mountain Trail is one of the closest trails in town, about 5 minutes driving. It’s popular for it’s proximity, easy to moderate hiking, and spectacular city and valley views. This year-round trail is best hiked during the weekend and early in the day during summer, though much of the trail it shaded, it still gets hot. For a true alpine experience, with open meadows filled with wildflowers, meandering mountain brooks, conifer forest, and basalt pinnacles, my favorite trail is the East Fork Trail in the Jemez Mountains. Frequently, rock climbers are practicing their skills climbing the basalt pinnacles at the beginning of the hike. I like this trail for its breathtaking beauty, sound of water, and minor elevation change. An hour driving time from Santa Fe that takes you through the spectacular Valle Grande National Preserve is all it takes to reach this exceptional experience.